I never do these listy-memes because I fear revealing something truly laughable about myself. 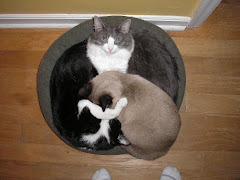 Plus I like to think my blog, although often cat-oriented, is really more about "serious" topics. But Bill's doing it, Clancy's doing it, John's doing it. So I guess, in the spirit of being part of my blogging community, I'll give it a go. And, anyway, what's so bad about revealing the laughable? I like to laugh (see TV shows below). But, after this, my next entry will be a serious one. Really. After all, the bloggers are getting restless. 4. Um. I don't know. Something with lots of fancy visual stuff. LIke, I *have* watched the Matrix more than once. And Fellowship of the Rings. And the original Star Wars. 4. And, yeah: whoever has updated. I mean, come on, I have a blogroll. What more do you want? 1. Chocolate. Dark chocolate. Dark chocolate with dried fruit and nuts. Dark chocolate with a little bit of chili pepper. Dark chocolate. Mmm. Four People To Be Tagged: I won't do that to you. If you feel so moved, you do it, too. Hey, I had a five and dime store job, too. I was about 14 (clearly underage to be working), and Mott's paid me $1.00 an hour. ;-) And no, this wasn't in the 1930s.... it was just a pitiful wage for someone underage. I'd contend that memes are one of the affective aspects of blogging. While all of us may be hesitant to reveal some aspect(s) of our lives, I think when we do, it has the potential to create a more personal/professional/affective connection with others, which I think in turn leads to a larger audience. Declaration of Heaven on Earth! Please give us all, the full heaven on earth! I thank you, & I worship you.